Three men boating in the Niagara River were overwhelmed by the river's strong current, lost control of their boat, and crashed into a rock. The current carried two men immediately over the Falls to their deaths. 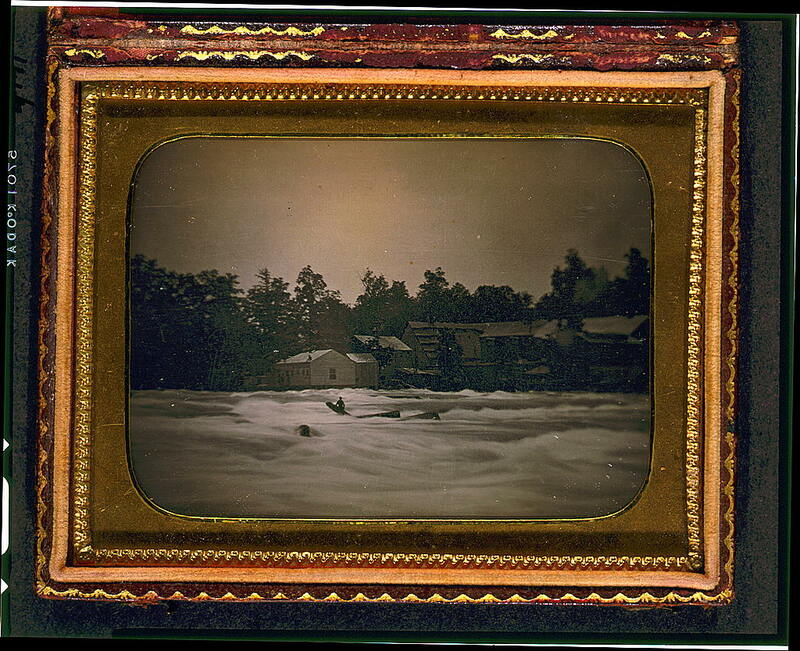 The daguerreotype shows the third man, stranded on a log which had jammed between two rocks. He weathered the current for eighteen hours before succumbing to the river. The image is an early example of a news photograph. I was shown the scene of the last catastrophe, just above the American fall. It is a small rocky islet to which an unfortunate man clung with terrible tenacity for three days. He had been drawn into the rapids, and was on the point of being swept over the falls, when his course was arrested by the little island. Far better would it have been for him had he not met with this obstruction; for his agony during those three long days and nights was fearful. All attempts to save him were abortive; and at the close of the third day, being unable to cling longer to the rocks, he was carried over the cataract. 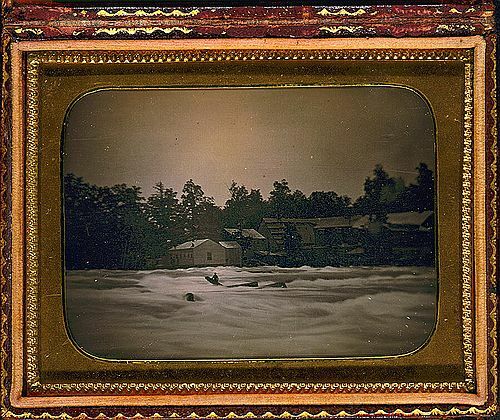 An American daguerreotypist reaped a rich harvest by taking impressions of the poor fellow during his agony. Fast in the rocks below, scarce out of the surges raught. Was it a life, could it be, to yon slender hope that clung? Shrill, above all the tumult the answering terror rung. As it had been in some blessed trance, and now it is noon. Lord! if it strike him loose from the hold he scarce can keep! And to its proven strength he lashes his weakness fast. Taut, now, the quivering lines; now slack; and so, let her go! Save for the rapids' plunge, and the thunder of the fall. Sport of the pitiless waters, the raft to which he clings. Tugging at rope and at reef, while men weep and women swoon. Down to him from the bridge through the rapids has safely passed. Maddening against the gate that is locked athwart his way. Tell us, who are you?" "His brother!" "God help you both! Pass through." As in a wind of autumn the leaves of autumn are tossed. Headlong on to the cataract's brink, and out of the world.